Samsung’s new Android smartphone surpassed public expectations in so many ways, and also managed to create a lot of discussion regarding the Android market place. And yet, the Galaxy S III is not a perfect product. There are areas where S3 could have done better. If you are still undecided about getting a new smartphone and don’t know which one to choose from iPhone 5, HTC One X or Samsung Galaxy S III, I will give some props about this product. What are the cool things you have seen in the Samsung Galaxy S III and what are the things we don’t love that much? This is not necessarily a big advantage of S3 because iPhone 5 and HTC One X are on the same level. But I had to start somewhere and I think it would be suited to start with the one thing you see first: the display. S3 features a Super AMOLED with a resolution of 720 x 1280 pixels and a diagonal of 4.8-inch, which makes it an excellent tool for Internet browsing and watching movies. Colors are well played, good contrast. S3 Respond instantly to commands and it is a pleasure to use this display. It turned out that choosing a 2100 mAh battery was an excellent choice for the Samsung Galaxy S III, and folks measured autonomy reaching 10 hours of video playback or Internet browsing. In reality, Galaxy S III could last longer throughout the working day, with active data connection. Right now, Samsung Galaxy S III is the most powerful Android smartphone on the market (until Motorola RAZR i is released). It’s very fast and everything happens instantly. It seems that it doesn’t heat as much as HTC One X when used intensively. 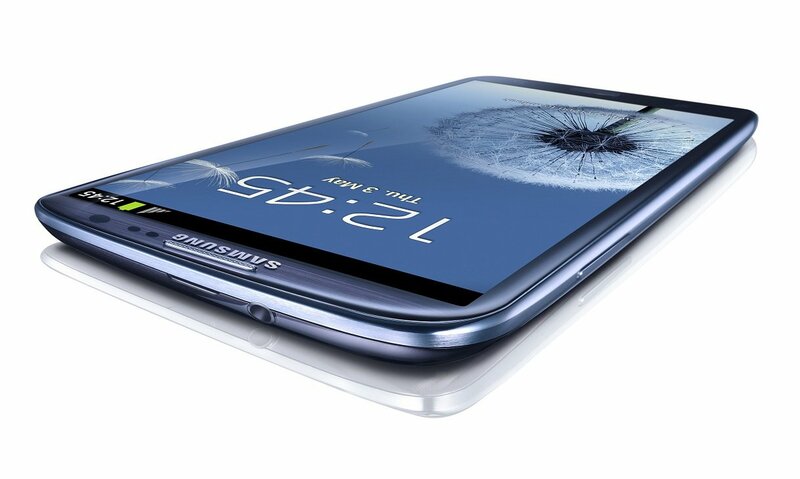 Samsung Galaxy S3 brings a wide choice of services and software enhancements in order to create a more pleasant user experience. The use of smart sensors (motion, microphone, camera) that make an intelligent device is a notable aspect. AllShare integration means a lot to users who have Samsung networked systems. In the interface you will find shortcuts to Samsung customized services such as recommendation and download of applications, videos etc.. I really love the feature that allows me to play a video in overlay mode anywhere in Android. And more importantly, I love that it comes with a pre-installed Android version of Flipboard. In addition to the 16/32 GB storage available, Galaxy S III has a microSD slot for those who want extra memory. Let’s face it: the memory is never enough! Undoubtedly the biggest con that I see in the Samsung Galaxy S III is related to the white plastic case. It is very thin, and on top of that, it is really shiny. Every trace of fingers remain visible and they are rather unpleasant. When you compare this with HTC One X, Nokia Lumia 900 or the iPhone 4S, the S3 is way behind. Everyone is complaining about the case’s quality, and I’m really sorry to say that they messed this up so bad, because S3 is a really good smartphone. Maybe this is just me, but I was expecting that Samsung Galaxy S III will be released with an unique design, not a reshape of Galaxy Nexus. After Galaxy S and S II, where we can see the iPhone’s influence , Samsung Galaxy S3 should have been more special in that area. Although strongly changed, TouchWiz UI is not consistent as it should be. There are too many differences between the apps menu, calling menu and personalized apps. It is true, there are not as many bugs as in previous versions, but the bugs still exist and I’m sure any S3 user will experience them sooner or later. No matter how good the Super AMOLED display is when it comes to color rendition, it has a drawback: when used in sunlight it does not provide the best experience. Especially if we compare it with the ONE X’s screen, the LCD2. Samsung Galaxy S3 (you can buy it cheap from Amazon) has amazing features, and like any smartphone out there, it’s amazing in some chapters, is lacking in others. For some of my friends it’s just a big phone and nothing else, for others it’s a really fast smartphone, for others it has an amazing camera. If you’re into style and fashion, this is not the phone for you. Maybe you should get an iPhone 5 instead. If you want cool features, no software limitation, speed and free apps, this is the right smartphone for you!